By now, you’ve probably heard that vinegar is an all-purpose wonder product, right up there with coconut and olive oil. But of all the things you can do with vinegar, using it to clean is at the top of the list. For me, the smell of white vinegar still evokes memories of coloring Easter eggs. Back in the old days, when I was a kid, it was one of the ingredients of Easter egg dye. My days of coloring Easter eggs are far behind me, and I now associate the smell of vinegar with… cleaning. Vinegar is such a wonderful, economical and environmentally friendly cleaning product. It’s available by the gallon and is cheaper than smelly, harsh chemical-based cleaning products. It deodorizes, cuts grease and soap scum, and dissolves mineral buildup. Plus, it acts as a disinfectant because its acetic acid content kills odors and most mold, bacteria and germs. Little fact about me: I buy vinegar by the gallon… and it's not for cooking. I make almost all of my own cleaning products and vinegar is used in many of them. Today I'm sharing 15 ways I use vinegar to get my house clean over on the blog. Link in profile. Here’s just a sampling of what vinegar can do. Do you live in an area with hard water? If so, like me, you’re constantly battling mineral deposits on your faucets. Soak a paper towel or an old cloth in distilled vinegar and wrap it tightly around the calcified area. Tie a plastic bag filled with 1/3 to 1/2 cup vinegar around harder-to-wrap faucet spigots. Leave it for two or three hours. Then, use an old toothbrush to scrub off the loosened deposits. For stubborn, tough to remove areas, scrub with a paste of 2 tablespoons salt and 1 teaspoon white distilled vinegar. Rinse off with clear water. Warmer weather and outdoor grilling will be here in the blink of an eye. Along with the great cookouts comes the yucky job of cleaning the grill. For a clean grill with no chemical residue, spray a solution of half water and half white distilled vinegar onto a warm (not hot) barbecue grill. Let sit for about 10 minutes. Then, spray full-strength vinegar onto a piece of wadded-up aluminum foil. Scrub the grill vigorously. You may need to repeat. Rinse. Get rid of stubborn bathtub grime, mildew, and scum from the tub, tile, shower curtain or door by wiping it down with undiluted white distilled vinegar. 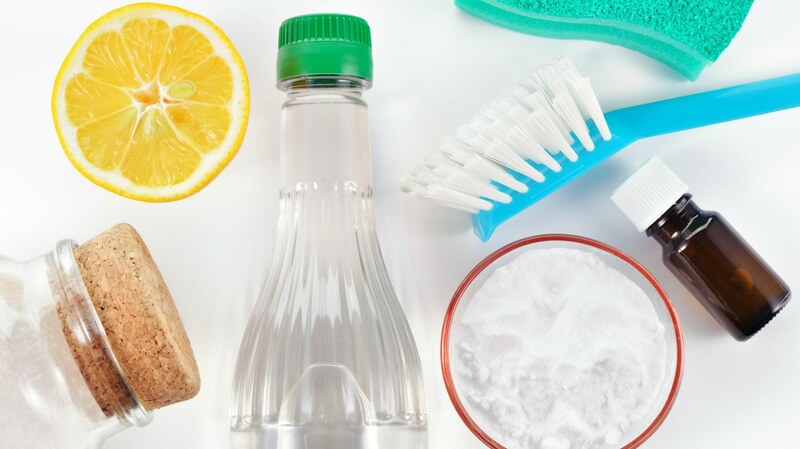 Scour more stubborn areas with an inexpensive tile cleaner solution of 1/2 cup baking soda, 1 cup white distilled vinegar and 1 cup ammonia to a gallon of warm water. (Be cautious of possible harmful fumes from the ammonia.) Rinse with clear water. Glass shower doors can be sprayed with full-strength white distilled vinegar after squeeging the glass or before stepping in and turning on the water. This helps release the hard water deposits so they don’t remain on the glass. To unclog your steam iron, pour equal amounts of white distilled vinegar and water into the iron’s water chamber. Turn to the “steam” setting and iron a soft rag to clean out the steam ports. Leave the iron on for 5 minutes in an upright position. Then unplug and allow it to cool. Empty the water to remove any loose particles. Repeat the process with clear water, then thoroughly rinse out the inside of your iron. To clean a scorched iron plate, heat equal parts white distilled vinegar and salt in a small pan. Rubbing this solution onto the cooled iron surface should remove dark or burned areas. Wiping down toys with chemical cleaners means your baby might be sucking off chemical residue. Swap it out for vinegar. Clean and disinfect baby toys by adding a good-sized amount of white distilled vinegar to warm, soapy water. Clean toys thoroughly, using an old toothbrush for those hard-to-reach places. Rinse with clear water and dry. Vinyl baby books and larger toys can be wiped clean with distilled vinegar on a damp cloth. Toys are always in the mouths of babies and toddlers, so clean them frequently. Use vinegar to easily restore sparkle to gold. Pour vinegar into a small jar, drop in your gold jewelry and twist the lid tightly shut. Let the items soak for 15 to 20 minutes. Shake the jar gently for a few seconds. Remove each piece of jewelry and scrub carefully with a soft toothbrush. Rinse under hot water. Repeat if there’s sludge under the stone. Dry with a clean, soft cloth. The final results should be sparkling! Warning: Don’t use this process on opals and pearls. Originally published January 2012. Updated March 2017.